Jack Eustace Chudleigh, known as Jack, was born in Yeovil in the summer of 1897, the son of Corn Trade Traveller Benjamin Chudleigh and his wife Marion née Guppy. In the 1901 census Benjamin and Marion, together with children Hilda, Leslie, Jack and Evelyn, were living at Grove Avenue. In the following census of 1911 the family were still at Grove Avenue. By this time Benjamin was describing himself as a Corn Merchant and he and Marion had been married for 20 years. They had five children, four of whom survived and were then living with them; Hilda (aged 18), Hugh (aged 16), Eustace (aged 14) and Evelyn (aged 12). At the outbreak of war in 1914, at the age of 17, Jack enlisted in the Yeovil Volunteers. Later he enlisted in the 14th (County of London) Battalion (London Scottish), London Regiment (Service Number 7206). He enlisted in Yeovil and, from his Service Number, he joined the London Regiment between 1 March and 6 April 1916. The 14th (County of London) Battalion (London Scottish), London Regiment, and therefore Jack Chudleigh, saw almost continuous action during the latter part of 1916. Jack’s unit was engaged in the diversionary attack at Gommecourt, the Battle of Ginchy and the Battle of Flers-Courcelette – all of which were part of the British Somme Offensive. During most of the period of hostilities between 1914 and 1918, Gommecourt was in the front line of the Western Front, occupied by the German Imperial Army, and was virtually destroyed as a result of the violence to which it was exposed. The neighbouring villages of Hebuterne and Foncquevillers 800 yards or so to the west, being conversely in Allied Forces occupation, were used as the bases for an assault upon it carried out by the British Army on 1 July 1916, as a part of the Somme Offensive, although it resulted in a severe defeat for the British. The Battle of Ginchy took place on 9 September 1916, when the 16th Division captured the German-held village. The British began a bombardment early in the morning but waited until late afternoon to advance, in order to deny the Germans sufficient time to counter-attack before dark. The British assault in the south by the 56th Division and the 16th Division reached Bouleaux Wood but the attack in the centre was repulsed. On the northern flank, Ginchy was captured by the 16th Division and several German counter-attacks were defeated. The loss of Ginchy deprived the Germans of observation posts, from which they could observe the whole battlefield. The Battle of Flers–Courcelette was a battle, again within the Somme Offensive, launched on 15 September 1916 with the battle continuing for a week. Flers–Courcelette began with the objective of cutting a hole in the German line by using massed artillery and infantry attacks. This hole would then be exploited with the use of cavalry. It was the third and final general offensive mounted by the British Army during the Battle of the Somme. By its conclusion on 22 September, the strategic objective of a breakthrough had not been achieved; however tactical gains were made in the capture of the villages of Courcelette, Martinpuich and Flers. In some places, the front lines were advanced by over 2,500 yards (2,300 m) by the Allied attacks. The battle is significant for the first use of the tank in warfare. It also marked the debut of the Canadian and New Zealand Divisions on the Somme battlefield. It was during this battle that Jack Chudleigh, acting as an officer's runner, was wounded. Just days earlier he had been awarded the Military Medal (pictured above), a military decoration awarded to personnel of the British Army and other services below commissioned rank, for bravery in battle on land. The medal was established on 25 March 1916. It was the other ranks' equivalent to the Military Cross, which was awarded to commissioned officers. As told by the officer (see below) it is thought that Jack was killed on his way to a first aid station after being wounded. He was just 19. "Sympathy is felt for Mr. and Mrs. Chudleigh, of Braeside, Grove Avenue, Yeovil, in the loss of their son Private J.E. Chudleigh, who has been killed in action in France. “Jack” as he was familiarly known amongst a host of friends in Yeovil, was only 19 years of age. He joined the London Scottish about eight months ago, previous to which he belonged to the Yeovil Volunteers, joining at the start, and holding the rank of section commander, and his genial disposition and bonhomie made him exceedingly popular in the platoon, amongst the members of which his memory will be long cherished. From an early age until his voice broke, Jack Chudleigh was a chorister at the parish church, and was one of the most popular members of the choir. He was also a member of the Yeovil Male Voice Choir. He was a lad of fine physique, and the splendid tribute paid to the deceased by his Commanding Officer and the knowledge that their son had won a coveted distinction on the field of battle, not long before he paid the supreme sacrifice, will no doubt afford some consolation to the parents in their hour of grief. The letter received from the deceased’s Commanding Officer gives the reason for the long delay in giving his parents the sad information. The writer adds:- “On the evening of September 19th this Company had an exceedingly difficult task to perform, which necessitated the whole Company moving across an area sniped by the enemy. Captain HL Lyer, who was leading and in command of the Company, was the first to be hit, and was dangerously wounded. It fell to me then to “carry on”. Your son was acting as ‘runner’ to me, and was wounded soon after we started. As I was by him I know that the wound was not serious, for he left me to find his way to the aid post, and I naturally reported him wounded. After that date we took part in many other such enterprises and attacks, and it was only at the beginning of this month that your son’s platoon sergeant handed me the pay-book and pocket-book belonging to your son. This was given to him by a man, a -----company stretcher bearer, who was then down at the base for a rest. This man had had them handed to him by a perfect stranger to him telling him they had been taken from your son’s body. No other information was given but that man stated your son was certainly dead. This company stretcher bearer returned only yesterday, and it was then that he gave me the latter information, because I had before hoped that your son’s jacket had been taken off to dress the wound, and these articles were later found by someone. I have made enquiries for the man who originally found your son’s body, but can get no trace of him, and can only conclude that man has also since become a casualty. I cannot speak too highly of your late son. On many occasions he carried messages through difficult and dangerous parts, and went out on patrols and reconnaissance work often because he was found to be so reliable, and showed great courage on all occasions. It is feared that on his way to the medical aid post, he must have been hit again, this causing his death. He was a great favourite in the Company, and Capt. Lyer thought no end of him, in fact he recommended him for an award, and I am proud to tell you that the Military Medal was awarded to him a short while ago, though too late, unfortunately for your gallant son to wear. At the parade of the Yeovil Volunteers last evening sympathetic allusion was made to the death of Private Chudleigh, and, as a mark of respect to the memory of the deceased, the “Last Post” was sounded by Bugler Newton, the platoon standing at the “present.” Mr. Chudleigh has another son in the Army, Trooper Leslie Chudleigh of the West Somerset Yeomanry, who joined up in 1914, was wounded in the Dardanelles and in hospital for three months, and who is now on service in Egypt. 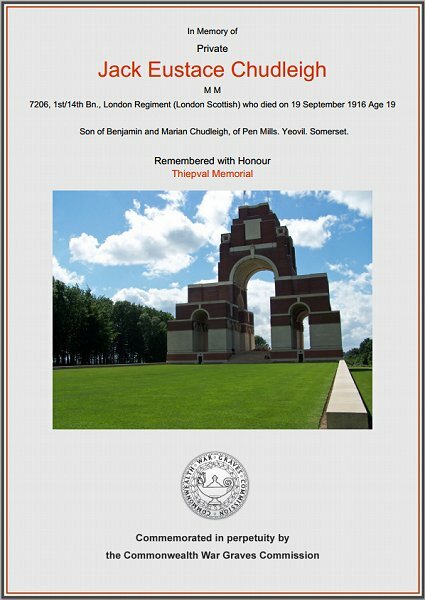 Jack Chudleigh is commemorated on Pier and Face 9C and 13C of the Thiepval Memorial, France. His name is also recorded on the War Memorial in the Borough. The Commonwealth War Graves Commission certificate in memory of Jack Eustace Chudleigh.